This will be a great STREET PHOTOGRAPHY opportunity for anyone looking for a colourfull spring day out with thier camera. Expect a great day at this World famous landmark. If you want to experience Turkish culture with music, entertainment, food and wonderfull friendly people then this is a good place to start, and a good place for a beer when were done taking photos. As you may be aware, Turkish Day in London was postponed in response to the mining accident in Soma, Turkey. Our thoughts remain with the family, friends and colleagues of those who have lost their lives. Thank you for the incredible amount of support and positive messages you have shared with us over the last few days. We were very touched by your understanding about our postponement of Turkish Day in London. 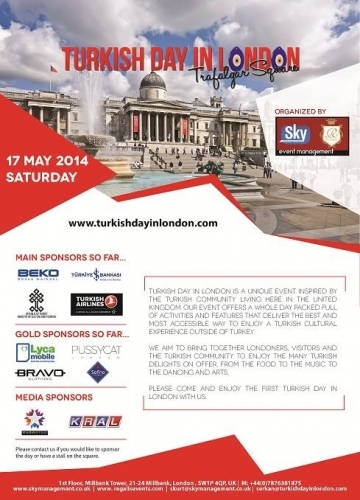 We are pleased to announce that Turkish Day in London will be on Sunday 1st of June 2014 at Trafalgar Square. We are also pleased to say that all performers, exhibitors and activities remain unchanged. Please share the new date and posters with your friends, family and colleagues. We hope that everyone can get together and enjoy the day! “Turkish day in London is a unique event inspired by the Turkish community living here in the United Kingdom. Our event offers a full day packed full of activities and features that deliver the best and most accessible way to enjoy a Turkish cultural experience outside of Turkey. This year, UK & Turkey Events set out to organise “Turkish Day In London” in Trafalgar Square, exposing Turkish culture to the masses with an event that was to be the first of its kind in the United Kingdom and on a massive scale. Finishing point: Tattershall Castle (ship), Victoria Embankment. What is the London Photo Walk? Every six weeks the London Photo Walk takes in a different part of London. Photographers of all levels come and meet other snap happy people to make friends or learn more about photography whilst walking around the capital. We'd love to have you at the Photo Walk, simply turn up to thenext eventand get involved! For more information and to keep in touch why not join ourfacebook group. For general London Photography news and chat keep up with us on twitter. The London Photo Walk is sponsored by Spherical Images 360 Virtual Tours. Stunning, HD, Fullscreen, Virtual Tour company, based in London. The London Photo Walk is sponsored by Mango Pie. Bespoke event designers. The London Photo Walk is running on a WordPress engine, with a WhitePlus body kit developed by Militaru.